Although there is not a written record when exactly beer has entered the soil of Malaya, the existence of the beverage can be speculated though the timeline of our history. Here we are not talking about wine or spirits which were produced locally as early as the civilisation existed on this land. We have no accessible information about the influence of beer production from the Chinese even though we had trades with them for centuries. The Chinese had been producing beer similar to the Egyptian Mesopotamia’s brewing methods long ago. We can only start the link from the time when the Malay land was exposed to the European culture starting in the 16th century. Early 1500s - The earliest possible link of imported alcohol hitting the shore of the Malay lands would be during the 130 years of Portuguese’s colonisation in Malacca. Portuguese has a brewing history dating back to the ancient Roman time and it would be possible that they might have travelled with them some beer during their arrival in South East Asia. However, any beer that sailed along with the Europeans would have turned sour by the time it hit our shores as the technology at that time had not allowed beer to sustain the hot weather here. Late 1820s - The more prominent existence of “palatable” beer in Malaya would probably be during Straits Settlements under the British control in the early 19th century. One particular brewer – George Hodgson figured out a way to brew a type of ale that was not easily spoiled by increasing the alcohol and hop content. Hodgson’s Indian Ale was exported to India since the 1790s so when the British came along to South East Asia, they would have brought with them some drinkable beer. As Hodgson’s ales had a lighter colour than the usual brown ale produced in England, it was called “pale ale”. As it was prepared for the Indian market, it was therefore named “Indian Pale Ale”. Although Hodgson with his discovery allowed the single brewery to dominate the Indian market at that time, that glory didn’t last very long. Within a few years, several brewers based in Burton-on-Trent which became Hodgson’s competitors discovered the recipe and improved their flavours. The 1850s - After the Liverpool Rail Link was opened, more brewers in England started to export their ale to the British Empire. The Federated Malay States with Singapore as the main capital, became under British direct control as a crown colony in 1867. With a large population of Chinese and small but important European population, ale would have been made available to them as part of their lifestyle. Tin mining as major trade by the Chinese, ale played an important role as a substitute of food for the workers ; whereas for the Europeans it was a necessity, especially for the soldiers. 1900s – Under the British rule, the free trade policy has encouraged trading from Europe. Many more beer labels were therefore became available. Danish brewing company Carlsberg was one of the European breweries that exported their beers to Asia, the label was first imported to Malaya in 1903. 1931– The first brewery in Malaya was established and was built in Singapore. 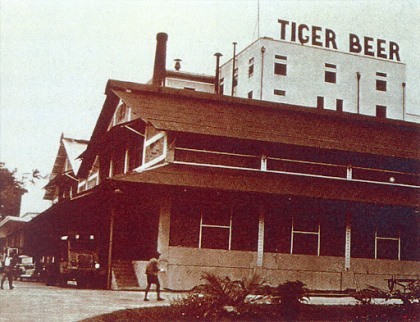 Malayan Breweries Limited (now Asia Pacific Breweries) partnered with Fraser and Neave and Heineken from Holland, started brewing Tiger beer in 1932. In the same year, Archipelago Brewery was established and was the first commercial brewery in Singapore producing a German label - Becks. 1941 – Archipelago Brewery was closed down by the British due to its German tie and was seen as an enemy territory. The same year, the brewery was bought over by Malayan Breweries Limited where the latter is currently still operating from today. 1950s – Malaya was not much affected by the First World War. However, the Second World War has disrupted many imports from the west. After the war when Malaya went into emergency, help was sent from Europe, Australia and New Zealand. According to John Grigsby, (a war correspondent that time from The Age, Sydney Morning Herald) he gained supplies of Australian beer for the 2nd Battalion, Royal Australian Regiment in Malaya between 1955 and 1956. His photos of troops holding ice cold beer that appeared in the Australian newspapers attracted breweries from Australia to ship their beer to Malaya. It was said that “the Malayan beer was not to the taste of the Australian troops and was never cold enough”. 1964 – Incorporation of Guinness Malaysia Limited. It merged with Malayan Breweries (Malaya) Sdn Bhd in 1989 and changed its name to Guinness Anchor Berhad (GAB). 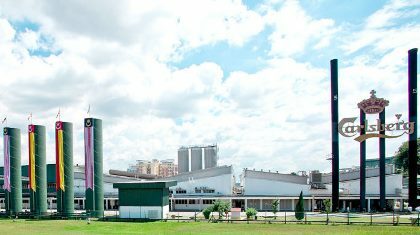 1969 – The same year Singapore was expelled from Malaysia, Carlsberg Brewery Malaysia Berhad was incorporated to build a brewery in Shah Alam, right at the outskirt of the capital city of Kuala Lumpur. 1972– Carlsberg Brewery took 2 years to construct and finally sold its first locally brewed Green Label in Malaysia. 2005 – Prime Minister Abdullah Ahmad Badawi announced that no more brewing license is to be issued again in Malaysia. 2007 – A surprise grant of the third brewing license to Napex Brewery Sdn Bhd was approved. A new local brand of beer called Jaz, hit the market. Together with this label, the brewery also started a German brew Starker, which was marketed through a bar chain named Overtime. Jaz, hit the market. Together with this label, the brewery also started a German brew Starker, which was marketed through a bar chain named Overtime. 2008 – Luen Heng Sdn Bhd joined Carlsberg to import more international commercial and craft beers. Carlsberg outlets are introduced these imported labels sold in bottles and some on draught. 2009 – Craft beer bars that import labels from overseas started to sprout in Klang Valley, Craft Brew in 2009 (now Gourmet Garage since 2012), Bruxale in 2010, Taps Beer Bar and Beer Junction in 2012. 2010 – The first Oktoberfest in Malaysia organised by GAB with imported German label Paulaner. 2012 – Ales & Lagers became the first craft beer retail store in Malaysia. More beer festivals in Malaysia including the first craft beer festival in Malaysia organised by Taps Beer Bar (Better Beerfest), Brewfest in Publika organised by Loille BDMP Sdn Bhd and The United Nations of Beer Festival in Genting organised by Carlsberg. In 2013, we will be celebrating a few beer festivals just like the past few years. But what would you like to see in our beer scene now that we have imported craft beers? What other new beer trend that will happen in Malaysia? Head Chef at the School of Hospitality, Sunway University, on the team of winners that snagged first place. A visual journey of Hennessey X.O’s tasting notes, from the mind of Ridley Scott. Champagne on the high seas. Whether it's your first date, or you've got a babysitter looking after the kids for the night, get it right on date night.